What The U.S. Has Given To Fight Ebola, From Thermometers To Soap : Goats and Soda U.S. aid is beginning to flow into the countries fighting the deadly virus. But while protective equipment and food supplies are vital, what's really needed now are health workers. The U.S. is providing supplies to combat Ebola. But people are needed as well. 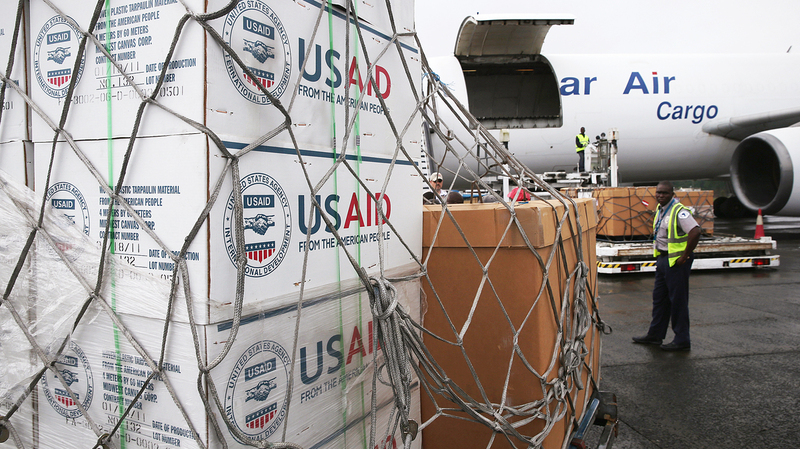 Over the past month, the U.S. has begun to ramp up aid to Ebola-stricken countries in West Africa. U.S. contributions could soon top $250 million dollars, according to the White House National Security Council. 100 rolls of plastic sheeting, which can be used to construct Ebola treatment centers. 25-bed hospital for treating healthcare workers who might become infected. But there's a vital component missing from the list: The people needed to bring the outbreak under control. The CDC has somewhere around 100 specialists working in Liberia, the nation hardest hit by the virus. USAID has just 27. And though the Department of Defense has offered to erect a 25-bed field hospital, it hasn't offered any personnel to staff it. By contrast, the much smaller nation of Cuba just offered to send 165 doctors, nurses and specialists to aid the outbreak in Sierra Leone. The World Health Organization says every 70 beds devoted to Ebola patients require between 200 and 250 staff to care for them properly. Many of those workers could be local, but there's an enormous need for outside expertise as well. The non-profit Doctors Without Borders, which has facilities throughout the region, says Ebola cases are surging, and they can't keep up. "They were turning [away] between 30-40 people a day in Monrovia alone," Sophie Delaunay, the organization's executive director, tells NPR's Jackie Northam. "This is an untenable situation for our teams." Editor's note: The original headline for this post, "What The U.S. Has Given To Fight Ebola (And Why It's Not Enough)," could be read as judging the U.S. effort. That was not our intent, and we have revised the headline.